Learn about Tulsa, Oklahoma and Route 66 by reading this updated reportFlying to Tulsa Oklahoma - Where Fun and Memories Mix Traveling Route 66 by Charlie Spence, aviation writer and IFA member. It features a mini, but thorough tour of the destination, plus all you'll need to know to plan your trip including getting there, objective information on places to stay and things to do. At the end of the article, we've provided a summary of the contact information for your easy reference. Enjoy! 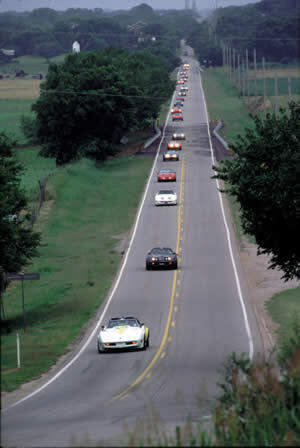 Vintage cars travel along the two-lane Route 66. When you decide to visit Oklahoma you will have one major problem; that is, trying to determine what part of this state to visit, because every square mile has fascination, history, beauty, enjoyment, sports, and just about anything else you would want. There is much to take in, so for this tour we will center in the area around Tulsa and leave other parts of the state for later visits, which you will surely want after this trip. Fifty-five distinct Indian tribes call Oklahoma their home. Each tribe has its own language or dialect. Throughout the state you will see and marvel at the Indian influence. The state's name comes from two words in the Choctaw language: 'ukla' meaning person and 'huma' meaning red. Together they mean red person. And, put Tulsa together with old Route 66 and you have another combination that can be long remembered. In the Tulsa area you will find a unique blend of cowboys, touches of southern charm, Indian ambience, and modern dynamics. That southern charm is a reminder that Indian ancestors'who were in the 'trail of tears' forced resettlement of tribes'brought with them some of the southern traditions they knew in their Alabama homes. When oil was discovered it attracted big names such as Rockefeller, Skelly, Phillips and Getty who brought some of the eastern elegance to the booming cities. The wealth that oil brought turned Tulsa from a cow town to a booming metropolis. Your first stops in Tulsa may be at the museums that resulted from this oil wealth: the Gilcrease and Philbrook Museums. The Gilcrease Museum houses the world's largest collection of art of the American West. And there you will see historical documents, maps, and manuscripts. The Philbrook Museum is on 23 acres of natural woods and sweeping lawns right in the heart of Tulsa. Oilman Waite Phillips donated his mansion and grounds for this showplace of both European and American Indian art. Oklahoma is not often thought of as a center for aviation but the state has an impressive history in flight. In 1930 the municipal airport at Tulsa was the busiest airport in the United States. Tulsa's aerospace history goes back a hundred years and you can see much of it at the Air and Space Museum and Planetarium. Here you will see vintage planes, and historical aircraft, including such as the Spartan C-2, built here in the 1930s, and the F-14A Tomcat fighter jet, Rockwell Ranger 2000, and other locally built aircraft. If you like fascinating history and architecture, take a walking tour of downtown Tulsa. In the late 1920s Tulsa was known as the 'Terra Cotta City' for its beautiful examples of art deco buildings. Internationally known architects designed buildings in Tulsa and many of these structures are now listed on the National Register of Historic Places. Buildings by Frank Lloyd Wright (Westhope), Barry Byrne (Christ the King Church), and Bruce Goff (Boston Avenue United Methodist Church) are considered outstanding examples of deco style. In addition to these structures, other art deco buildings include Tulsa Union Station, the Fire Alarm Building, Warehouse Market, and Will Rogers High School, among others. And speaking of Will Rogers, by all means take time to soak up more about this humorist by visiting his birthplace and museum. Just 30 minutes out of Tulsa on Highway 169 you will find the town of Oologah with the statue of Will as 'The Cherokee Kid' and just out of town is the birthplace ranch of 400 acres. The home is authentically preserved and open to the public from eight to five daily. 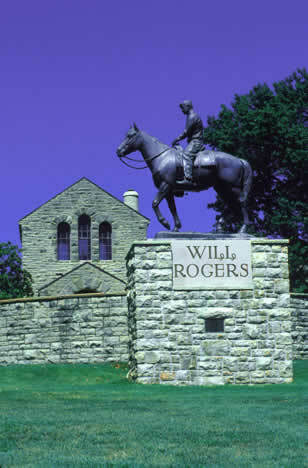 The Will Rogers Museum is in nearby Claremore with nine galleries, three theaters, and a special children's section. Here you will see many artifacts from Roger's days in the Ziegfeld Follies through his days as a movie star, radio commentator, and newspaper columnist. Everything from racetracks and highways to schools and streets are named for this legendary personality. 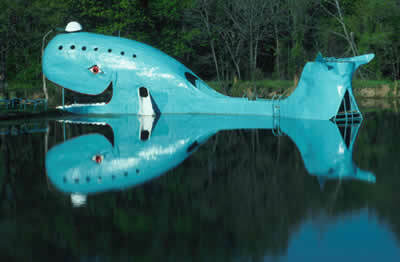 The old Blue Whale amusement site gave pleasures to travelers then and offers fun and photo opportunities today. While finding out more about this popular cowpoke of a by-gone era, it is time to tour Route 66, the famous highway of the past. About 80 to 85 percent of the original 2,400-mile route remains. In Oklahoma, virtually the entire route remains intact. You won't find it on the modern maps. It was decertified in 1985, so it's wise to get a specially prepared Route 66 map from the Oklahoma Route 66 Association. Oklahoma has almost 400 miles of Route 66 and any direction we take from Tulsa will be a trip down memory lane. It took transportation planners nearly a half-century to realize highways should not be built through major towns, so we find some of Route 66 right in the city limits of Tulsa. Small shopping centers, car-related services and an old time bowling alley are along what is now East Admiral Place. A bit farther west are additional vestiges of the Route's glory days: vintage shops, quaint restaurants, and the University of Tulsa's Skelly Stadium. The Route 66 Diner still offers small-town service and generous portions of nostalgia. Almost the entire rest of our journey can be taken without going on the Interstates but we will have to follow their guidebook. The easiest to follow sections are still marked as Highway 66. These are Vinita to Catoosa east of Tulsa, and Sapulpa to I-35 exit west of Tulsa. Visiting Tulsa is not just soaking up and enjoying the Indian history and the cowboy atmosphere. Visiting Tulsa has fine golf courses to challenge you and frequent rodeos to excite you. Discoveryland! is the "national home for Rogers and Hammerstein’s Oklahoma!” complete with horses and wagons and, of course, the surrey with the fringe on top. Performances are nightly (except Sunday) June through August. This is just 10 miles west of Tulsa on West 41st Street. There's plenty to do in the evenings, too. Try your luck at one or more of the many casinos. Operated by Osage, Cherokee, and other Indian Tribes, some casinos offer full hotel accommodations that include nightclubs and entertainment, restaurants, golf courses, and complimentary airport transportation. One evening go down to Cain's Ballroom on Main Street. This is a Tulsa landmark where Bob Wills and the Texas Playboys appeared for many years. Cain's has hosted a variety of musical groups, country, western swing, rock and roll, since opening in 1924. In the 1930s it was a honky-tonk complete with a spring-loaded dance floor where the sounds of Wills and the Playboys brought the rhythm for distinctive Oklahoma-style dancing. Today, Cain's presents experimental and mainstream performances but there is plenty of memorabilia, such as life-size posters of cowboy singers, to remind us of those older days. After dinner at one of the fine restaurants go to the Tulsa Performing Arts Center, across the street from the Crowne Plaza Hotel, to see a presentation by the best of national touring company Broadway productions. Time your visit to the show you want to see by checking the website, www.tulsapac.com. For shopping, be sure to go to one of the Indian stores, like Lyon's, which has been in downtown Tulsa since 1916—for Indian art, turquoise jewelry, moccasins, blankets, and other Indian goods and souvenirs. Then, indulge yourself with a massage and hours of shopping at Utica Square. Built in a village-like design, this historic shopping center offers stores like Saks Fifth Avenue, Ann Taylor, Coach, and Crabtree and Evelyn. Tulsa was settled by Creek Indians who named the settlement 'Tallasi,' which in Creek language means 'old town.' But after your visit, you will know that Tulsa is not only a city with an historic past, but a vibrant present and a promising future. Humorist Will Rogers is one of Oklahoma's favorite sons. This is in his hometown of Claremore. Tulsa has two fine airports to welcome you: Tulsa International and Richard Jones. Tulsa International has three FBOs and while they are geared to the business jet, they will provide service for any aircraft. Runways:18L/36R' 9999X299 concrete; 18R/36L'6101X150 asphalt; 8/26' 7376X150 concrete. Approaches: ILS, LOC, VOR, VOR/DME, VOR, NDB, ASR, GPS RNAV. Richard Jones is the busiest airport in Oklahoma, mainly because it has six flight schools. There are two full service FBOs. Tulsa is the 45th largest city in the United States so you know it has available a variety of accommodations depending upon your tastes. At least eight bed and breakfast houses in different areas of the community offer the more intimate accommodations. Hotels and motels range from the inexpensive through national chains and plush suites. Here are just a few of the good places to eat that you will find in Tulsa. Bourbon Street Cafe' on East 15th street. Seafood, steaks, and pasta with a Cajun flair. Live music Fridays and Saturdays. Murphy's Steak House on Frank Phillips Blvd. in Bartlesville. A local favorite. Their 'hot hamburger' is a plate full of burger and fries with gravy. Utica Square has several excellent dining establishments from which to choose. A few are: Fleming's Steak House—prime beef, fine wines; P.F. Chang's—Chinese cuisine; Pepper's Grill—a Mexican touch offering prize Tex/Mex; Polo Grill—fine food and an excellent wine selection; The Wild Fork—savory salads and decadent desserts. Notice: This information is current as of February 2009. It is recommended that you contact the numbers, and/or visit the websites above to determine any changes to the information.